4 decades to create, 12 years to assemble. All in one place. 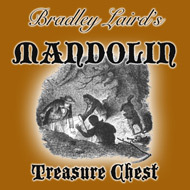 This page is a complete list of all of Brad Laird's mandolin video lessons including 23 free video lessons. Tune up your mandolin and have fun! This page is a listing of 60 video mandolin lessons including lots of free videos. This list is organized them in the most logical way to help you learn to play quickly. I suggest that you bookmark this page! You will come back here many times as you practice and progress with your mandolin playing. The lessons begin with the basics such as tuning and simple mandolin tunes and progress through learning a lot of the great standard bluegrass jam session tunes. These videos also will teach you a great deal about chords and the music theory that you can use to strengthen your abilities as a musician. As you build your physical skills on the mandolin you will also learn how to improvise solos and play in every key. I have put a lot of thought and planning into these lessons and they are proven to work! 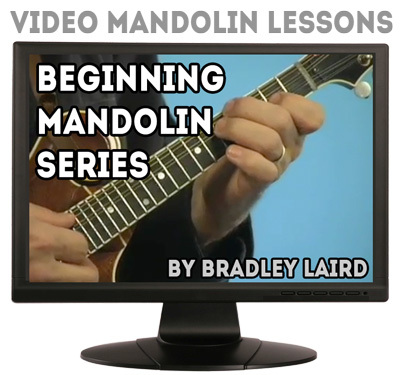 Thousands of mandolin students all over the world are using these videos. Getting Started* Basic information for all beginners on mandolin. Tuning a Mandolin* Learn to tune your mandolin. Beginner Mandolin Chords* Easy 2 finger chords to get you started. Reading Mandolin Tab 1* Basic tablature reading. Reading Mandolin Tab 2* Learn to read slides, hammer-ons, and pull-offs. Beginning Mandolin 1 First lesson, crucial information. What is a Major Scale? * Essential music theory on one simple topic. Basic Chop Chords* Bluegrass style chord basics made simple. Rhythm Basics* Understanding your role in the bluegrass ensemble. Beginning Mandolin 3 Lesson with new tune & speed-building. What is a Chord? * Watch this and you will know. Beginning Mandolin 4 Chords and "slow jam" practice on 3 songs. Greensleeves Chords* Practical use of simple chords. Greensleeves Melody playing in two time signatures. Cripple Creek: 3 Versions Common jam tune. Lot's of improvisation ideas. Cripple Creek Jam Session* Try jamming on Cripple Creek with no pressure. Moveable Major and Minor Chords Absolutely essential knowledge for backup. 17 min. How to Adjust Your Action* Is your mandolin setup hindering your progress? Barre Chords and 7th Chords More vital chord information. Having Trouble With Chop Chords? * A solution for uncooperative or small hands..
Chop Chords for Small Hands Learn new ways to play chop chords with smaller compact shapes. What Is A Doublestop? * Learn this fun & common mandolin technique. Exploring Doublestops 1 How to locate and use doublestops. Exploring Doublestops 2 More ways to locate and understand doublestops. Sally Gooden: Rhythm and Chords* Good advice on getting a solid bluegrass chop. Sally Gooden: Tune and Variations Learn 4 ways to skin this cat. Muddy Roads - Old Timey A great old time tune I learned from Doc Watson. Red Haired Boy: Tune & Improvisation Ideas Watch even if you already know the tune. Old Joe Clark: 3 Versions Great old tune, useful ideas you can use. Whiskey Before Breakfast Basic tune and some good variations. Bluegrass Solo in 2 Keys Popular jamming tune in 2 different keys. Salt Creek: Tune & Improv Ideas Common tune, uncommon licks and ideas. Blackberry Blossom & Improv Ideas A great vehicle for exploration. Moveable Blues Licks You can make a lot of hay with these licks! Soloing in Moveable Positions Get familiar with moving all over the neck. Chord Progressions by the Numbers A fun and valuable lesson with no playing in it! Chord Triangulation Part 1 Learn this system and do less thinking as you play. Chord Triangulation Part 2 The rest of the system. How to Change a String* It is probably time you changed those strings. Pentatonic Improvisation Basics Just what the title says. Pentatonic Improvisation 2 More ways to use pentatonic scale notes. What is a Blues Scale? * Watch this and then you will know. Instant Mandolin Blues* A cheap trick. Good food for thought. Pentatonic Improvisation 3 More improvisation ideas. Playing with Building Blocks A way to think about building solos from scratch. Pentatonic Roadmaps 1 Get over your fear of "odd" keys the easy way. Pentatonic Roadmaps 2 Continuation of lesson above. Turnaround Lick in D* Easy useful "mini-solo". Explains turnarounds. Turnarounds Learn 5 turnarounds in 5 keys. More Turnarounds How about 5 more turnarounds? Mississippi Sawyer Good old tune, more useful ideas and licks. Click the link to find out how to get it free! Stealing Jazz Licks 1 Stretch your boundaries in seeking new ideas. Stealing Jazz Licks 2 More boundary exploration. Tips: I would suggest that you proceed one by one through the lessons. By simply reading the title you might think that you "already know that" and will miss some valuable insights. For example, lots of beginners learn to play Salt Creek (or whatever tune) early on. So, they see Salt Creek on the list and they skip it because they think they know the tune and wouldn't get anything by studying that lesson. Trust me on this, I have packed these lessons with loads of little details, techniques, concepts, licks, tricks, ways of thinking about things, and improvisation ideas. While the lesson might, on the surface, be "Salt Creek" you might be surprised by the additional insights you can gain by looking deeper into "tunes you already know." What you learn by exploring "Mississippi Sawyer" might teach you some valuable things about triplet embellishments and jazz chords. You will never know unless you dive in and see for yourself. When you click on any of the links above you will find a more detailed description of the lesson contents and length. The free lessons have the tab and/or chord charts right on that page along with the video player window. The premium lessons are delivered to you as a zip file containing the video file, any audio tracks and the tablature as a PDF file. You store them on your computer and do not have to be online to watch them. I think that if you explore the premium lessons you will discover that they are a good value. The premium lessons are a lot less expensive than a single private lesson and you can go over the material as many times as you need to until you get it. I don't force you to subscribe or commit to recurring credit card billing plans. Who knows, in a couple of months you might decide you don't want to play the mandolin or don't have time. If you wanted a cup of coffee should you have to sign up for a 3, 6 or 12 month membership at the coffee shop? I don't think so. With my lessons, it's strictly pay-as-you-go. Frankly, a lot of people have trouble learning to play because they are not following a well-thought out plan. Maybe you need a plan. If you want to be a mandolin player, and if you believe like I do that it is a lot more fun to really play than to wish you could play, scroll up and get busy. That list is a plan that will get you really playing and, if you bought every video I have ever made and all of my ebooks, and I hope you do, you'd still spend less than the price of an entry-level mandolin and a couple of sets of strings. And, if you embark on my plan and ever have a question, just shoot me an email. I don't mind a bit. And, one last thing I'd like to suggest. Once you get started, be sure to subscribe and listen to my free audio podcast for students. You'll find it here at www.grasstalkradio.com. I create the podcast for you and it may be just the boost you need to stay on track and make great progress. Curious what other folks think of my videos? Click here.